We’ve all be coddled by the maturation of various game genres which makes the nostalgic design choices in games like Castle in the Darkness so damn interesting. Older games made a lot of their design choices based on technological limitations. When those limits are gone it is fair to question why some old school tropes are brought back while others are improved upon. I got lost in Castle in the Darkness in more ways that one. Take away my map and suddenly I’m not quite as adventurous as I thought I was. The branching paths are subtle at first, as I didn’t necessarily realize that I was diverging from my original objective until I was confronted by impassable objects or brutally difficult enemies. Castle in the Darkness teaches you the risks of exploring beyond your means. This also means for better and for worse that you will spend a lot of time back tracking as you figure out the correct path to use to make progress. However, getting lost is important for you to know what to come back for once you have the skills you need. Normally, if I had a map I could see exactly where I should stop before turning around, but I found myself exploring a bit further just to find landmarks to make note of for when I was ready to return. As I was lost, it gave me a lot of time to appreciate how Castle in the Darkness’s world comes together. I barely had the energy to worry about where I was going and if I was lost because the moment to moment platforming and combat required my focus and attention. The last thing I wanted to do was figure out the next step in my adventure but not have enough health to survive it or make it to that next save point. 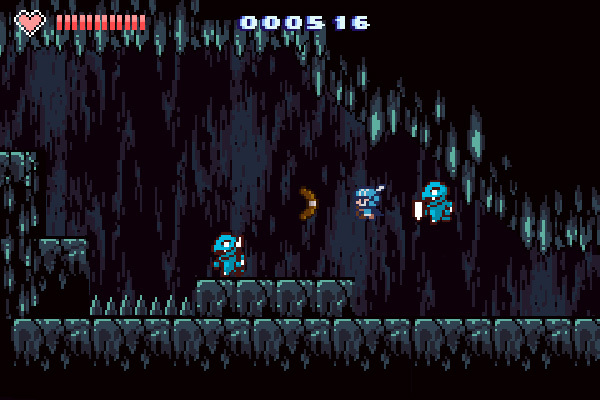 Usually, I want to rush through adventures like these as fast as possible so I can get to the next cool moment, but every step in Castle in the Darkness encourages you to play on the screen you are on instead of worrying about screens that may as well be miles away. Thanks, Castle in the Darkness for making me appreciate purposeful pixels again.